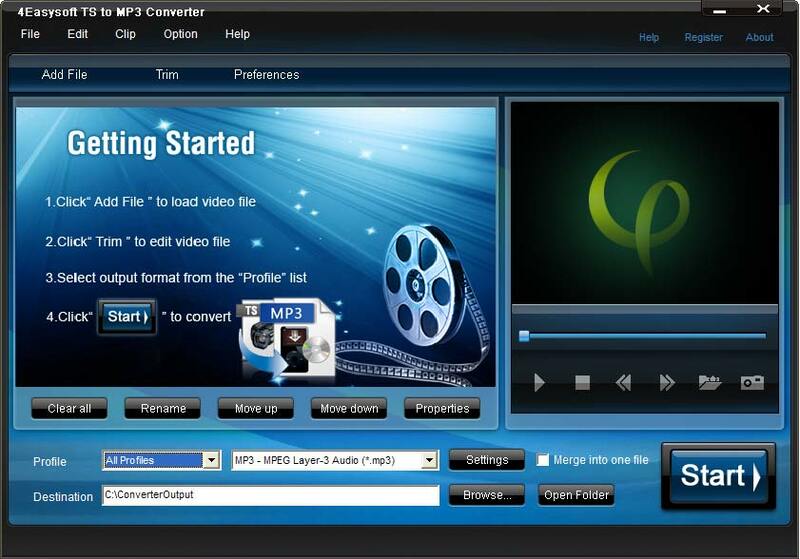 Furthermore, with this TS to MP3 Converter, you are available to convert all popular audio formats, like WAV, WMA, M4A, RM, RAM, OGG, AU, AIF, AIFF, APE, FLAC, NUT, etc to MP3, MP2, OGG, WAV audio. If you want to extract a song or episode from a movie, select audio track and subtitle, you can try 4Easysoft TS to MP3 Converter. With 4Easysoft TS to MP3 Converter, you can get MP3, MP2, OGG, WAV audio formats from video, like MTS, M2TS, AVI, MP4, WMV FLV, RM, 3GP, etc, and audio, such as WAV, WMA, M4A, RM, RAM, OGG, AU, AIF, AIFF, APE, FLAC, NUT and so on. You can set many output audio formats for input file(s) then let 4Easysoft TS to MP3 Converter processes the multi-conversion successively. 4Easysoft TS to MP3 Converter provides an easy way to combine and join multiple files together. Detailed audio settings are provided by TS to MP3 Converter tool for you to adjust, such as Encoder, Audio Channels, Sample Rate and Audio Bitrate. You also can save all the output settings as your preference, which is saved in the user-defined column automatically. You will get output audio like MP3, MP2, OGG, WAV with perfect sound quality. Having the user-friendly and smartly organized interface, 4Easysoft TS to MP3 Converter brings you more convenience and enjoyment.